Disappointed Chelsea fans may be buoyed by news that a 1945 photograph depicting their clash with Dinamo Moscow has been uncovered for an auction next month. The picture was revealed by UK auctioneers in a bid to provide some welcome cheer to Chelsea football followers after the team?s Champions League loss to Manchester United last night. It is one of three gelatin silver prints in a lot expected to fetch up to £4,000. A Bonhams spokesman said: ?For disappointed Chelsea fans this might just be the thing to cheer them up. A happier reminder of the club?s link with Moscow.? 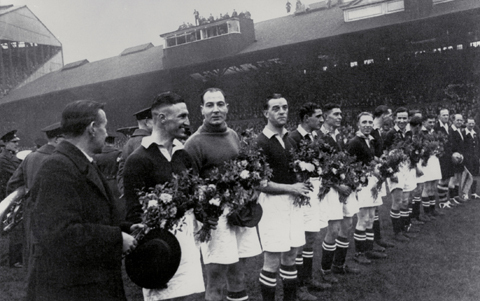 Captured by press photographer Ivan Shagin the image depicts a game played in November 1945, which ended in a 3-3 draw. The match took place in London. It is one of 145 Russian images to go on sale at Bonhams on 10 June.